"Pleasing set . . . The saxophonist is great . . . no wasted notes . . . Compelling music . . . This is fine, satisfying stuff." "Agile minds . . . O'Dell is an open, lyrical player who can unfurl a wide range of ideas at a dizzying pace . . . appealing atmosphere . . . flows beautifully . . . O'Dell designs hypnotic concepts that capture the imagination . . . indelible spirit." "This recording confirms the hopes we had placed on [O'Dell] . . . Probing excursions . . . On soprano, [O'Dell] skillfully avoids the saccharine tone that mars too many saxophonists . . . fiery dialogues . . . contemplative and lyrical communions . . . seamless and breezy . . . solid outing." with the audience . . . exotic flavors . . . They create impressions that let their audience travel through time and space." "Quality of music is excellent . . . "Rise and Fall" is a beautiful ballad that displays both Tim O'Dell's wonderful tone on soprano sax and Aoki's big, fat bass notes . . . unhurried duo musical communication . . . good soloing by the horns and swinging bass lines . . . "Old Growth" is stunningly beautiful." "Unusual and well crafted . . . memorable . . . O'Dell and Aoki in top-notch form . . . creative sounds . . . remarkable . . . smooth, mellow approach which is enjoyable. . . "Ancient Pines Suite" is intense in scope and presentation, and there is much good to say about it, and its thematic structure. [Ancient Pines Suite] is a strong entry for anywhere and anytime . . . Wide base of appeal . . . a fine example of what can be creatively expressed . . . wide range and a wide scope, and it entertains . . . straight-ahead stylings add to its brilliance. Highly recommended jazz fusion!" "O'Dell has a rich timbre and consistent vision . . . compelling terrain." "Fans of Maria Schneider's big band work will enjoy O'Dell's arrangements . . . reminiscent of Gil Evans, especially at times in the coloring . . . solid charts that clearly call on tradition . . . modern elements infused, like funky bass on "Adverse Side Effects," fusionesque electric guitar by Steve Grismore on "Cirrus" and "Retrospection" . . . The interesting works are well-played by this ensemble." ". . . talented saxophonist . . . it would be interesting to hear Tim O'Dell's music interpreted by a major orchestra." "O’Dell’s compositions are thickly scored and rich in extended harmonies with close chordal relationships, such as those heard in the work of Thad Jones . . . shifting kaleidoscopic, quasi-psychedelic rhythms . . . an amalgamation of thoughtfully serious compositions for the modern big band that many times play on concepts usually utilized in classical music: large formal structures, the development of rhythmic motives, large timbral palettes and advanced harmonic configurations." 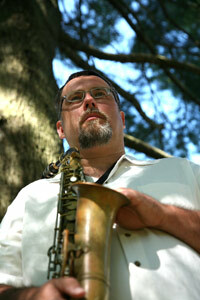 "Saxophonist Tim O'Dell is passionate about large ensembles . . . unusual big band program includes free jazz, fusion and bebop . . . O'Dell pushes the envelope using the large ensemble to play multiple layers of jazz-fusion on "Epilogue Groove." The reflective vibe of "Retrospection" has an exotic character and the brass harmonies highlight "Mr. ID." Nice work!" " . . . A thinking man's player and composer . . ."
" . . . Meditating on alto, Tim sounds like 'Trane did on Central Park West . . ."
"This is the sound of . . . expanding American art." " . . . A fine new voice on alto . . . loose and swinging and broadly expressive . . ."
"A trio of saxophone, bass and drums can opt for raw power or the potential for clarity that inheres in the form. This one opts for clarity, for spare rhythm in support of O'Dell's brisk linearity. The approach is rewarding on "Slow" and "All Things" when O'Dell's repeating phrases and strongly modal lines seem to fuse with Pavkovic and Aoki. O'Dell is a conscientious craftsman, a disciplined player with a strong sense of construction in his solos . . ."